Confirmation is a special time for 7th & 8th grader students to claim their own faith. At St. Peter Lutheran, our confirmation ministry is intended as an intentional time for students in 7th & 8th grade to prepare to confirm their faith as their own. By publicly affirming their baptism in the fall of their 9th grade year, they become full adult members of the congregation. Below is the welcome to confirmation letter sent to our students. Confirmation is an important time in your life as you learn more about the Christian faith and what you believe. On the day you were baptized, your parents and sponsors made some important promises for you. Confirmation is a special time of preparation for you as you get ready to make your faith your own. Then, in the fall of your 9th grade year, you’ll have the opportunity to stand in front of the congregation and make those promises for yourself (“confirming” what your parents promised on your behalf!). In return, the congregation will confirm you as a voting, adult member of the congregation. 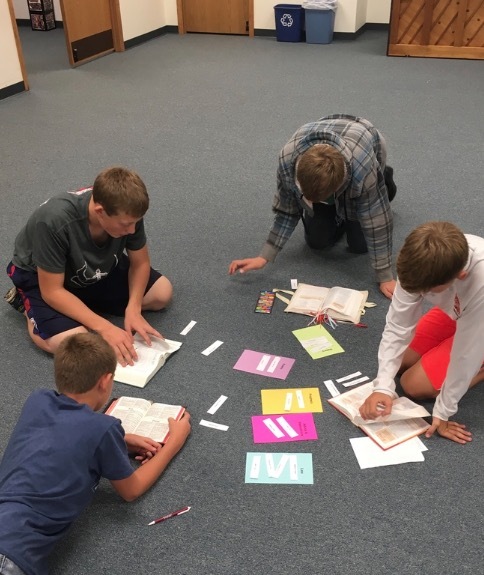 Through confirmation classes, service projects, worship, and Sunday School, we’ll explore more about the Bible, the Christian faith, our Lutheran tradition, and God’s promises to you. Worship is an essential part of life as a Christian. Worship is how we practice the faith we learn. Like all members of the church, confirmands are expected to be in worship as often as possible. Participation in mid-week Advent and Lent services is also expected. To help you engage with what’s happening in worship, each confirmand is expected to complete 25 worship notes per year. Worship notes forms can be found on the usher’s table in the back of the sanctuary, and on the hymnal cart in the fellowship hall. After worship, get a signature from a parent or other caring adult, and place the completed forms in the bin outside the church office. Worship notes may be completed at any worship service, including Sunday mornings, Saturday nights, holidays, midweek Advent and Lent services, weddings, or funerals. If you worship at a congregation somewhere other than St. Peter, bring a bulletin and attach it to a worship note form. Worship isn’t just something we watch, it’s something we do. An important part of the confirmation program is exploring ways that you can participate in and help lead worship. This can be done by serving as an acolyte, lector/reader, usher, assistant minister, musician, giving a children’s message, or by helping set up for or clean up after services. You’re expected to serve as a worship leader at least once per month. Christian education is another important part of church life. Regular attendance and active participation in junior high Sunday School is expected of all confirmands. Confirmation classes will take place every Wednesday night (except holidays—see schedule) from 6:30 - 7:30. During Advent and Lent, we’ll meet for the worship service at 6:30 followed by an abbreviated class from 7:00-7:45. Please be on time for each class and bring your Bible and a writing utensil. If you must miss class due to illness or family need, let Pastor Daniel know by calling/texting him ASAP. If North Butler school is cancelled due to weather, confirmation is also cancelled. Approximately once a month, we will do a service project or other activity during our regular Wednesday evening class time. These are an essential part of the confirmation program and good practice for living a Christian life of service. Watch for more details on each activity a couple of weeks beforehand. This year, we will be focusing on the Bible, God’s word to us. By the end of the year, confirmands will be familiar with the basic story of the Bible and the way it reveals Christ to us. Confirmands will be expected to memorize the books of the Bible in order and to be familiar with how to read and study the Bible. We’re going to camp! Mark your calendars for October 14-16. We’ll be participating in the Dirty Feet Retreat at Camp Ewalu in Strawberry Point. There’s a fee of $50 per confirmand (Church will cover the rest of the cost, and if $50 is a challenge for your family, please talk to Pastor Daniel). We’ll leave church in time to be at camp by 8 pm on Friday, and we’ll be back by 2 pm on Sunday afternoon. This will be a great time of group bonding as we get a taste of summer camp, play some awesome games, and learn how to get our feet dirty as we follow Christ out into the world.